Tight budgets and high fuel costs are keeping lots of Americans home this coming holiday weekend. In fact, AAA projects a 2.5 percent decrease in Independence Day travel — a result of skyrocketing gasoline prices that are about a dollar per gallon more than last year. Because of this, 4th of July festivities may take a back seat. If you’re among the millions staying home this holiday weekend, just follow these budget smart BBQ tips to keep costs down. Supermarket snack trays, deli-made potato and macaroni salads, and cookie platters are tempting purchases, but making these foods at home will save roughly 30 to 40 percent. Clearly, time is of the essence when planning a party, so don’t try to do it all yourself. 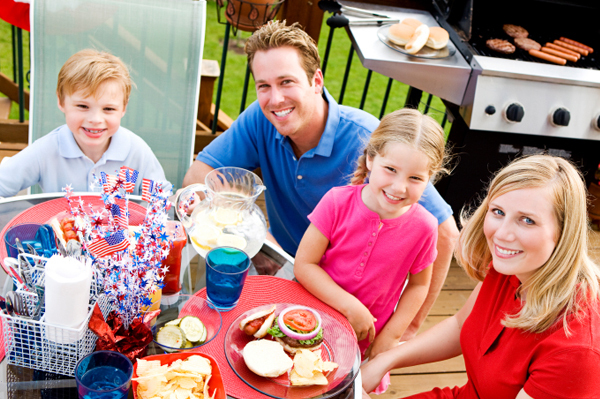 Get your family involved and spend the day before the party preparing the food together. Otherwise, consider hosting a potluck barbecue by divvying up menu items among guests or ask that everyone bring one of their favorite dishes to add a mix of flavors to the party. Seasonal decorations are a fun addition, but it’s a cost to consider cutting, especially since most will be trashed after the celebration. For a red, white and blue barbecue, hit up a dollar store for cheap yet festive decorations. You can find 4th of July-themed tablecloths, paper goods, balloons and streamers at prices up to 70 percent lower less than a standard party store. If you don’t have enough seating to accommodate your entire guest list, look to family, friends or neighbors for folding chairs and tables; absolutely don’t rent. Should you find yourself table- and chair-less, arrange quilts and blankets for a more casual picnic-style setting in your backyard. If space is the issue, invite everyone to meet at a local park or beach, where barbecue pits and picnic tables are already set-up. Break out the coupons for all your party needs, which you can print directly from sites like CouponSherpa.com before heading to the store, or use coupon codes for instant savings when ordering items from home. You might also start scoping out local daily deals from sites like BuyWithMe, which offer anywhere from 50 to 60 percent off various products and services, based on your location. Deals like 50 percent off the local farmers market will come in handy when prepping for a barbecue. Parents love a little time off from their kids, especially when trying to enjoy a party. But hiring a babysitter can get expensive, especially when there are numerous children to supervise. To save some money, have guests take turns watching the kids or ask one of the older children to act as a babysitter in exchange for a gift card from their favorite store.